The survey took place on Monday and Tuesday nights, and Rasmussen reports that there was no statistical difference in responses between the two. 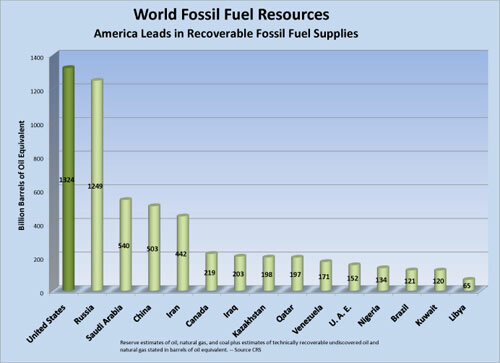 America’s combined energy resources are, according to a new report from the Congressional Research Service (CSR), the largest on earth. They eclipse Saudi Arabia (3rd), China (4th) and Canada (6th) combined — and that’s without including America’s shale oil deposits and, in the future, the potentially astronomic impact of methane hydrates. Having the resources is one thing. Being sufficiently free of Democrat tyranny to access those resources is something else. But who is going to hear Inhofe when the old lamestream media will ignore most anything that doesn’t support their laughable “green energy” ideology? 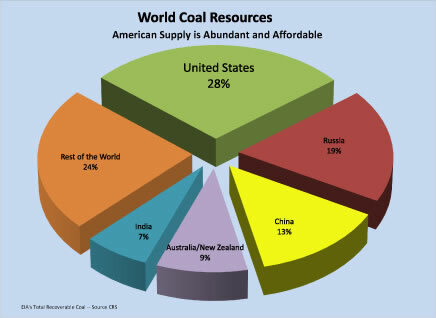 And coal, which can be converted to liquid transport fule, gasoline and diesel, from a 2009 University of Texas study for under $30 a barrel oil equivalent … Who has the world’s coal? So tell me, why does anyone listen to these liberal tyrants? The first autos were run on biofuels. And then really smart people said it costs too much to till the land, water the crops, harvest the crops, and then turn the crops into biofuels. Then Oil was discovered, the ultimate bio-fuel. 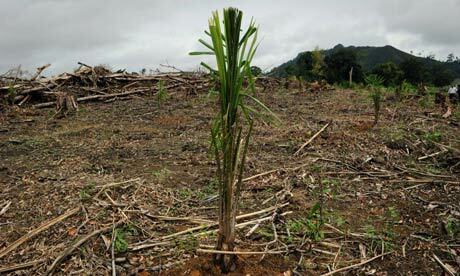 A young palm oil tree, growing where the rain forest used to grow. Bio-diversity replaced with lots of nothing, all in the name of saving the planet for palm oil trees. Palm oil is a lousy source of diesel fuel. Ask yourself, wouldn’t a hole in the ground be far less impact. Here is another interesting post on the same subject, protecting the plant, destroying the rain forests, formerly known as jungles. Did you know you can turn coal into liquid transport fuel, cheaply? Yep sure can, just ask WWII Germany how they did it, using a 1920s technology called Fischer-Tropsch. And look who has all the coal. Another amazing liberal lie. You notice how fast groceries are going up? Biofuel policy is causing starvation, says Nestlé boss. BATFE Gun Runner Scandal Continues to Grow: Who’s Lying? Start with, it was all about taking down the Second Amendment … And reinstating the AW ban. From Obama to Hillary. 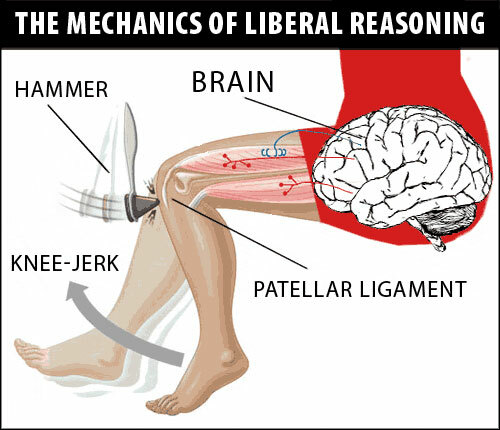 Liberals have unfairly held law abiding gun shop owners responsible for the violence in Mexico for years, but as evidence continues to pile up against the Bureau of Alcohol, Tobacco and Firearms, the Justice Department, Homeland Security and President Obama over what is now known as “Operation Gun Runner,” things aren’t looking so good for the Obama Administration. Like Issa says in the report: Someone is lying. So the BATFE’s temporary leader won’t testify at the Senate hearing, his choice he chose not to. So subpoena his testimony. Oh forgot, the Democrats won’t, he is after-all working for a Democrat and they protect, don’t they. So far, Congress and the media haven’t had much luck getting answers on the Bureau of Alcohol, Tobacco and Firearms’ ongoing “gunwalking” controversy.The Department of Justice and ATF have missed repeated deadlines to turn over information and documents to Sen. Charles Grassley (R-Iowa), who’s investigating. ATF Acting Director Kenneth Melson (at left) was scheduled to appear before a Senate hearing Thursday, in which he would likely have been asked questions about the scandal. However, CBS News has confirmed Melson has now been pulled from the hearing witness list. We contacted the Senate Foreign Relations Committee to ask why Melson is no longer scheduled to appear. They referred us to the office of Sen. Robert Menendez (D-N.J.) who chairs the subcommittee holding the hearing. A press spokeswoman at the senator’s office said it was Melson’s decision not to testify, and that the subcommittee doesn’t have jurisdiction over ATF. The gunwalking investigation may also have derailed any chance for Melson to have confirmation hearings anytime soon. President Obama made Melson, a former Justice Department attorney, acting director in April 2009. Sources on the Senate Judiciary Committee believed confirmation hearings for Melson were about to be scheduled before the gunwalking scandal broke. Now, they believe confirmation hearings for Melson will not happen in the near future. The House, well that’s a different matter, now isn’t it? They can subpoena anyone. Somewall Obaby. You are currently browsing the Tarpon's Swamp blog archives for March, 2011.